American commentators, in their commentary of soccer (what the rest of the world know as football) have not yet been able to capture for their TV viewers the flavor, magic, and sweetness of the game. In fact, for english-language commentary of the World Cup they seem to have deferred to their British counterparts. 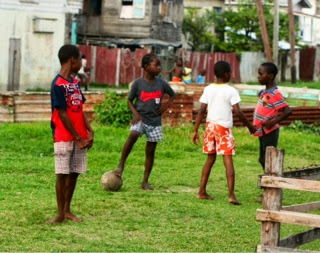 But even then, these English gentlemen, despite the rabid love of the sport in their country, are themselves unable to match, in their commentary, the excitement of their portuguese or spanish-speaking counterparts as they describe the unfolding games against the backdrop of the carnival and party atmosphere emanating from the various World Cup venues across Brazil. I find myself wondering whether the English language is the most ineffective language for describing football. As I hear the game being presented on ABC or ESPN, I can not help but wonder whether I am listening to commentary on golf. I find myself doing that which most english-speaking viewers here in the United States have done In order to hear the game narrated with the excitement that is its essence - grabbing the remote control and switching from ABC or ESPN over to Univision, the Spanish-language channel. The difference in the commentary is like the difference between night and day. Even the slow moments of the game is presented with excitement by the Spanish-speaking commentator as if something spectacular is about to happen. And who can match that commentator's eruption as he spews out that seemingly interminable cry of "Goooooooooooooooooooooooooooooooooooal!!!!" after the ball is headed or kicked into the back of net. And then again, when all is said and done, no language is really needed to narrate the unfolding of a football game; it simply transcends language.